A well maintained, properly fitted dry suit can be an important part of any UK diver’s equipment. 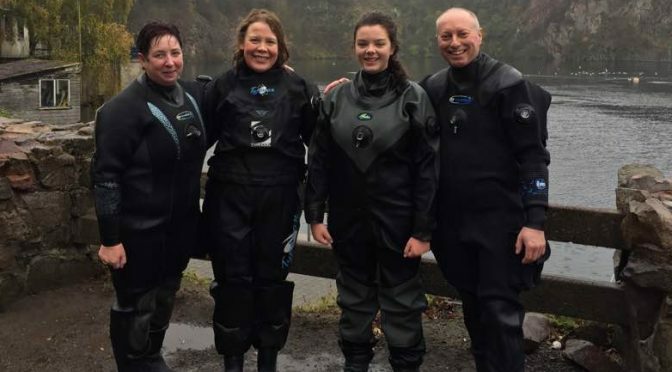 Dry suits have become extremely popular amongst divers, and are often one of the first major pieces of equipment bought by individuals beginning their diving careers. It is important for anyone using a dry suit to understand the significance of maintenance and fit when using these exposure suits. Ill fitting dry suits are difficult to use and potentially hazardous. A dry suit which floods can result in rapid heat loss from the diver. In very cold water there is the danger of hypothermia setting in very quickly. It may also result in rapid buoyancy loss causing divers to sink or to struggle to attain neutral buoyancy. Dry suits that are too small can result in limited mobility, with divers unable to bend to put their fins on or to manipulate their BCDs. This can create a stressful situation and limit the diver’s ability to react to problems. Overly tight seals can result in a loss of circulation to the hands and head. Warning signs of this include tingling in the hands, skin changing colour, light headedness and difficulty breathing. If left untreated, overly tight seals can cause serious problems for divers and should be addressed immediately. A dry suit which is too large may also result air migration. In suits with legs and boots that are too long or large, pockets of air can move through the suit and gather here. This can result in an increased chance of sudden feet first ascents, particularly in inexperienced students. In extreme circumstances a diver in a suit with legs that are too long can find themselves unableto fin, as their feet come out of the foot pockets and go into the legs of the suit. You may find it beneficial to review the appropriateness of dry suit accessories, such as ankle weights, and shin wraps which can improve comfort and positioning, and may reduce gas migration. When trying a suit, you should check that the neck seal is secure, but not over tight. When wearing a suit you should not be in discomfort and you should be able to breathe comfortably. You should also check that the seal is not too slack, and that water will not enter the suit when you move your head. Check you can move more fingers and practise manipulating the power inflator on a BCD to check the wrist seals are suitable. Always inspect seals for signs of wear and tear, and possible failure points. Dry suit valves should be checked to ensure normal operation prior to diving, and should be rinsed in fresh water after diving to help clear debris and salt traces from them. All dry suit valves should be regularly maintained in accordance with the manufacturer’s guidance. take this into account when you are trying one for fit. Make sure that your BCD will not obstruct or accidentally activate the drysuit valves. It is always advisable for divers using dry suits for the first time to receive proper instruction from a suitably qualified individual. If wearing a suit for the first time it is a good idea to either conduct a practise session in a swimming pool, or at a sheltered, shallow site before using it in more challenging locations. In addition to gaining experience with your particular suit, you can also use this session for signs of leaking or for indications that the suit is the wrong fit. Always check with the manufacturers for fitting advice for their suits if in doubt.